Tiffany Fox began studying the piano with Kate Faries at the age of 7 and later continued with organ and piano teacher, Ruth Henderson throughout secondary school as a Warwick Academy organ scholar. 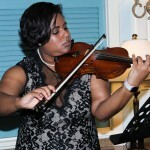 During this same period, Tiffany was introduced to the violin and studied with Sarah Bridgland of the Menhuin Foundation and later with Jennifer Sheridan of the Bermuda School of Music. 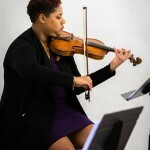 Upon leaving Bermuda, Tiffany studied with a number of respectable teachers in the Toronto and Ottawa areas, settling finally at York University, where she studied with Jaime Weisenblum and Yechov Lerner of the Toronto Symphony Orchestra, obtaining a Bachelor of Fine Arts in Violin Performance. After this Tiffany moved to London, England for a year to teach and learn, obtaining a Post Graduate Certificate in Secondary Music Education from the Institute of London and completing teaching practicums in two inner London schools. She is currently pursuing a Master’s of Organizational Management through Endicott College and anticipates graduating in 2014. 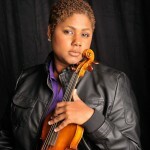 Tiffany maintains a private Suzuki Talent Education studio at her home in Southampton, teaches instrumental music at CedarBridge Academy and is very active in the music ministry of Christ Anglican Church, Devonshire. 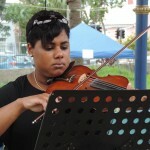 She regularly performs with the Bermuda Philharmonic Society, AMG String Quartet (of which she is a founding member), the Gina Love Band and enjoys solo gigs at small events. As Trustee and Treasurer of the Bermuda Youth Orchestra, it is her hope that students will motivate one another to strive for musical excellence.